Master-Bilt 761020CX (QUICK SHIP) Cooler/Freezer Combination Walk-In 9'-8" x 19'-3" x 7'-6"
You will earn 9,159 Reward Points. Earn 1 reward point for every 1 dollar spent. 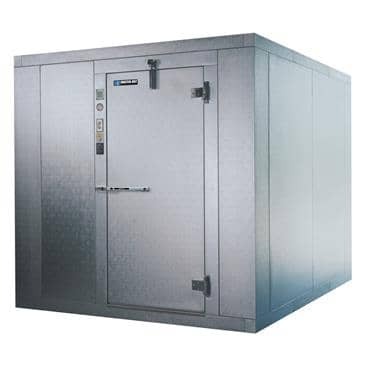 (QUICK SHIP) Cooler/Freezer Combination Walk-In, 9'-8" x 19'-3" x 7'-6" high, with .080 textured aluminum floor (freezer) 5'-9-1/2", floorless(cooler) 13'-5-1/2", 26 gauge acrylic-coated stucco galvanized steel interior & exterior, 4" pour-type, foamed in place rigid urethane insulated, (2) standard doors. Master-Bilt 860818FX (QUICK SHIP) Cooler/Freezer Combination Walk-In 7'-9" x 17'-4" x 8'-6"
Master-Bilt 760812CX (QUICK SHIP) Cooler/Freezer Combination Walk-In 7'-9" x 11'-7" x 7'-6"
Master-Bilt 861018CX (QUICK SHIP) Cooler/Freezer Combination Walk-In 9'-8" x 17'-4" x 8'-6"
Master-Bilt 761014CX (QUICK SHIP) Cooler/Freezer Combination Walk-In 9'-8" x 13'-6" x 7'-6"
Master-Bilt 761018DX (QUICK SHIP) Cooler/Freezer Combination Walk-In 9'-8" x 17'-4" x 7'-6"